I know I am breaking my own routine by not writing about the Starburst Melodies CAL but about my Nuts about Roses. But on the one hand side I messed up square 11 of the Starburst Melodies and had to frog it already twice and on the other hand I just couldn’t stop with my Nuts. The last square was Lise by probably one of my most favourite designers – Polly Plum. This one was so much fun as it was easy to make. Just the right square to finish of the square making. I love how in these squares my color choice really played well together. I still have a lot of yarn left of my color B – the really bright pink – and some of color C – the green – but I already have a stashbuster project in mind. I just wait until I am sure that I really don’t need any of those for the border. And then the joining started – it was the first time I ever joined squares together. The instructions called for a zipper join. I was happy about that because I like that neat look it creates. And it does not add too much to the already pretty busy blanket. Halfway through – when checking the Facebook group – I found out that I started totally wrong. I was supposed to start joining the short rows first and then add the length to it. I started with the length and then had to struggle a little bit with the heaviness of the blanket. I was almost finished when I realized that I twisted two squares on the last row by accident. So some frogging and a break later, all squares where at least halfway joined. Then the really tedious work began – the joining of the rows while balancing the whole blanket on my legs in a heat period going up to 36 degrees. What a hell but at least I now know that the finished blanket will be nice and warm. And I tested it already on my hubby and for his blanket I need to add at least one more row to it. I am already thinking on which squares I am going to pick as add-ons. But now I have to wait for two weeks until the pattern for the border is released. I hope that until then the weather is a little bit cooler cause I am not looking forward working on my Nuts in heat again. This week I have not been working a lot on my squares for my Nuts about Roses. But at the end my conscience kicked in and it kicked me really well. Maybe it also helped that I am actually close to finishing another big project. I present you the next two weeks even though I have almost finished two more. But one week is still on the blocking board and the last ones are still only half finished. The next square I finished is the lovely Fall Blossom by designer Aurora Suominen This square is so beautiful, I fell in love with it right away. It creates so much texture with simple stitches – I really enjoyed every minute with it. I am getting used to adapting the size of the last rounds now though in order to come out with squares which are equally sized. I just wished I had known that much in week two already – when blocking that one, I had to stretch it quite much and I could have prevented that by just adapting the stitches of the last rounds. But as the saying goes: we grow with every error we make – and believe me, I have grown much with the Nuts CAL. Or I might have become a designer with all those “design elements” added 😜. The next week brought a surprise – just two squares where on the list. But that’s actually okay for whoever is doing the math will surely see that 3 squares each week for 12 weeks would add up to 36 squares which would be hard to join in a rectangular blanket. We are actually doing 35 squares which will be joined to create a 5×7 blanket. The two squares where also not the same pattern but two different ones. The first one was the lovely Maroccan Window by Heather Gibbs. The second one the square Sweet and Fair by Julie Yeager. I actually am a little bit disappointed by the later one. It was nice and easy for sure – but I feel like it just does not fit in with the other squares as it lacks structure and depth. I will take a look at how it will fit in as soon as the final layout is out and might then consider a substitute. On the other hand my color C is running low so I might just have to live with it. 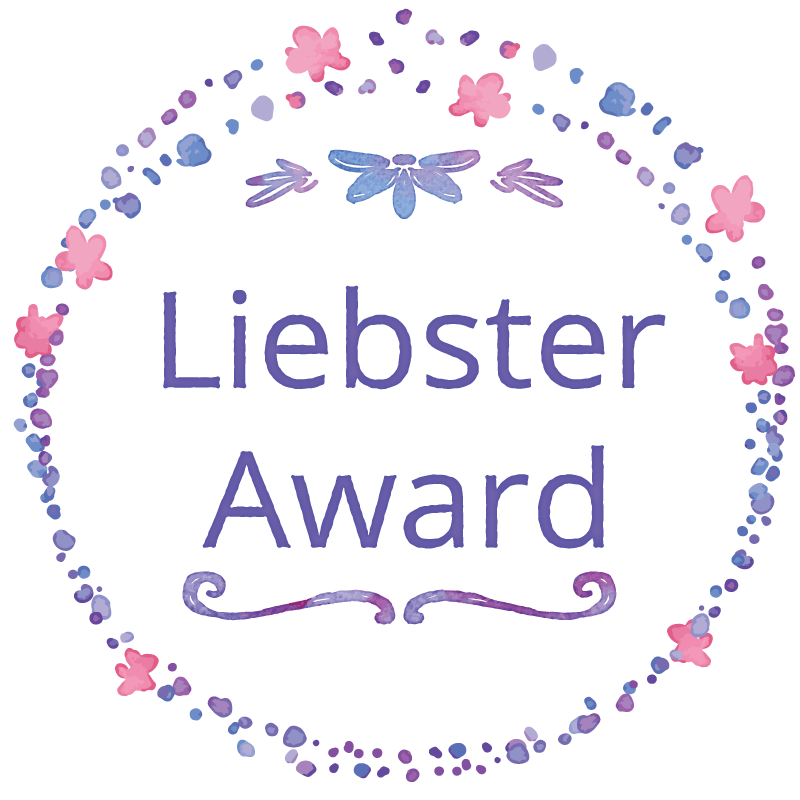 As I already hinted in my last post, I have been nominated for the Liebster Award. I have not heard about that award before but I am a newbie to the world of serious blogging, so I still have a lot to learn. It’s an award from bloggers for bloggers and was created so that people get to know new bloggers. My nomination came from fellow blogger Tracy of It’s a T-Sweets day! and I want to thank her with all my heart. Every time I read her blog, I feel like she is a kindred spirit. She seems to have the same creative interests – quilting, crocheting, traveling, cooking, … And when I see the gorgeous quilting projects, she is creating at the moment, I feel the urge to pick up some fabric and start up my sewing machine again myself. But what I find most amazing about her are her crazy crafty ideas – like setting up a doomsday preparation bucket (would never have thought about that myself) or organizing buttons by using safety pins (so simple but so never came to my mind). She is such an inspiration! Now the rules of the award state that I have to get personal. I am supposed to state 10 facts about myself so that you get to know me a little. Here we go! I am married to the love of my life for almost 15 years now. We knew each other already at school but then I would “never ever date him” – a fact over which we laugh still from time to time. We actually got married a long way from home – in Mombasa, Kenya. And we stuck to celebrating our anniversaries abroad since then as we share the same passion for travelling. I love to learn and am a strictly defender of the life-long-learning movement. I love plattforms like Coursera and EDX where you have access to a lot of courses on university level for free. In primary school I hated crafting class – I was a cocky little girl and thought that I knew better than my teacher voicing my opinion loudly. Therefore I was forced to stand in front of the class and tell my classmates how it’s done correctly as a punishment. As I actually didn’t know anything at all, it was quite a sobering, embarrassing experience. I started to get interested in crafts again when meeting my aunt years later. It was mostly crocheting but also some cross stitching and knitting. We spent hours together chatting, drinking coffee (lots of it!) and working on our projects. When we had a serious falling out, it took me a long time to actually pick up a crochet hook again. I am a book worm – I currently have over 1000 books at home (not counting ebooks) and have dedicated a whole room to them. It consists books on history (mainly Irish/Celtic), Wicca (I am a no longer practicing solitary), fantasy and sci-fi, classics, biology and psychotherapy (studied both but sadly never finished), management, requirements engineering and computer sciences (my daily business). I love my library! I am a collect-o-holic – I collect patterns (currently over 400 on ravelry not to count the real printed one in books and journals at home), fabric (could make approximately 10 quilts right away without worrying) and yarn (2 projects on the go, another one waiting, a whole set of Catania colors for amigurumis and some really old yarn I recently found again). My internet nickname is Silverwheel and has been choosen a long time ago. It is derived from Arianrhod, the Celtic goddess of the silver wheel, who is assoziated with the moon. I was always drawn to the moon and felt connected with the goddess right from the start. Might be because one other aspect of this moon goddess is called Brigidh – which is the origin of my real name. Tracy is also curious about specific things and has provided the following questions to her nominees. 1.How did you get started quilting or sewing or crocheting? I actually was forced to learn crocheting, knitting and sewing at school – girls where supposed to have crafting classes. I still envy the boys for learning to work with drilling machines and other “manly” machinery. I just never could get a hang on those. Quilting I taught myself 5 years ago – I stumbled over some beautiful projects in the internet, loved it at first sight and just tried it out. 2.If you could have one present, what would it be? 3.What is your favorite sewing tool? 4.What has been you favorite blog post? Of my own – none, my babies are all equal 😉 I enjoyed writing every single one of them. 5.Who has been your inspiration? Primarily my grandmother – she was always creating things. My memory is a little bit fuzzy on that cause I can’t remember any actual project, but I know she always had a crafty project with her on her visits. Other than that there are a lot of inspirational people on the net – Etty van Urk – the Cake Duchess – my cake modelling muse or Ester from It’s all in a Nutshell with her great youtube channel that makes crocheting really easy. I love strawberries and anything strawberry related. As a kid I always wanted a strawberry cake for my birthday and was always disappointed as they are not ripe in March yet. I grow some on my balcony garden and even though they are still not ripe in March, I love picking them right from the greens like we did as kids. Pure bliss …. I prepare my blog posts every Sunday – latest in the evening but mostly in the afternoon. I actually tried for some time to be ready earlier but I just never finish my projects in time ;). As a full time worker crafty joy has to be done in the evenings and on weekends only. Therefore I decided to publish regularly Monday morning my time zone (GMT+1). A long long time ago when I was very little, my mother did sew and knit (she actually finished one of my school projects because I hated knitting so much). Sadly she became very sick and lost her creative drive during her illness. 9.What makes a perfectly SWEET day at your house? Staying long in bed, having a nice breakfast on my balcony with my hubby and then settling down with some project watching our favorite series. 10.What advice would you give to future sewer/bloggers? Start with what you love and never give up. If something does not work out – and believe me it will, no matter if it’s sewing or blogging – just shake it off and continue. Get inspired by other people’s blogs – not only for projects but also how they set up their blogs. But most of all: enjoy the journey! Lovemade Handmade: Oh what lovely pictures you can find on that blog – not only are the projects gorgeous but you can learn a lot about professional photography there. I’m always a lazy daisy concerning pictures as I am always late for my weekly postings – but one day I want to have time to shoot such pics too…. The Messy Brunette: So many different projects here – from crochet to upcycling to embroidery. Creativity at it’s best! My Crafty Musings: Crochet inspirations in every post – all lovely bright and colourful. Catherine’s Crochet Corner: That blog is such an inspiration for me – not only for color choices but this ring binder cover idea went right on my must-really-have list of future projects. And everyone knows her gorgeous Demelza blanket, don’t you? Susanblog: this blog is written by a – in my opinion – very strong and creative woman. Not loosing hope in her situation and still producing such great projects (check out her beautiful fusion quilt <3), shows a strong spirit. For the guideline of the award check out this link here. And here are my questions to you, my dear nominees – looking forward to reading your answers soon! If you had only time for one more project – which one would you choose? What craft would you love to learn but did not have had time to try? Of all the projects you have ever created which on is your favorite? Travelling is my passion – what passion other than crafting to you have? You are stranded on a lonely island with only 5 items – which are your absolutely must haves you could not live without? As a bookworm myself I have to ask – what’s the best book which everyone should have read? What is the most important thing you would tell a newbie in your favorite craft? How many UFOs are currently in your to do basket? I am a little bit tired of creating endless numbers of squares for my current two CALs. Don’t get me wrong – I really love them and the challenges they bring up every week. However it’s kind of a perpetuum mobile – each week new squares, once done wait for the next and on and on and on …. This is why I needed some smaller in between projects. Projects which show a result pretty soon and make me feel like I achieved something right away. I started out by testing the newest hype – Rico Creative Bubble. It’s a yarn that can be used to knit or crochet your own personal kitchen scrubby. When I found it in a local store, I just had to grab two balls to try it out. The color choices are terrible but I guess that’s accounted to the material: 100% polyester and thats exactly how it feels like. As you can see in the picture it has tiny little “hair” – those should lead to the scrubby effect. It definitely does it’s job but it is also terrible on your fingers when you are working with it. I did not buy the corresponding books as they contained just simple patters which just would not be worth the money. I thought I could just wing those anyway without a pattern. I decided to give it a try with a simple round mandala design. Nothing fancy really but after several trials and errors it became clear pretty fast, why the books contained only simple patterns. You just can’t make anything other that looks at least a bit neat. I then decided just to wing a quick pattern that contains only single crochet and drop stitches. It looks okay but I surely will not work with that yarn ever again. And I would definitely never ever use it as a bath scrubby as the manufacturer actually suggests – I rather prefer natural products on my skin. The second in-betweener was an idea that I had on my mind for quite some time now. I had bought a 9cm cross stitch hoop and wanted to create a mandala to hang in there. It should then become part of my craft room decoration. I have been searching the world wide web and ravelry to and fro, bookmarking 1 million new project ideas, but never finding anything that fitted 9cm. I fell in love with the pattern Rhiannon by Grace Fearon however and I thought I might give it a try using crochet thread. And guess what – it fits perfectly! I messed up with crocheting around the hoop on the last round a little and it ended a bit too loose. So I had to become creative in tightening them up. It’s not perfect but I love it nevertheless. Did you know that there actually exists a youtube playlist for the Stardust Melodies CAL? Each square is designed around a peace of music and it’s really fun to listen to it while crocheting along. The second square was fun to make as it creates a lot of texture with simple stitches. It’s called Fools Rush In and it is well named – I did rush in, messed up in the beginning and had a hard time figuring out where I went wrong. I had quite a laugh afterwards about that. The third square is called Don’t Fence Me In – a nice and easy pattern that will actually make a great square in between some busier squares. I am now trying to take the complexity of the pattern into account when choosing the colour of the square. I have settled on a colour layout right in the beginning and now need to fill in the appropriate squares when the pattern is released. As you can see in the picture the square fits well next to the Fools Rush In but lacks next to Begin the Beguine. The CAL continued with a square called I’m Beginning To See The Light. Now if you need to practice bobbles you should try this square. But it’s fun to see the square in the square growing in the process. It’s a little bit wobbly and needs blocking but I just store it on my blocking board for the moment until I am sure that each square ends up the same size. Until now it works fine but my experience with blocking the Nuts about Squares CAL has shown me not to get to cocky. One square might just make me reconsider the size I thought would be appropriate. Even though that means that I will have a lot of squares to block before being able to crochet them together.